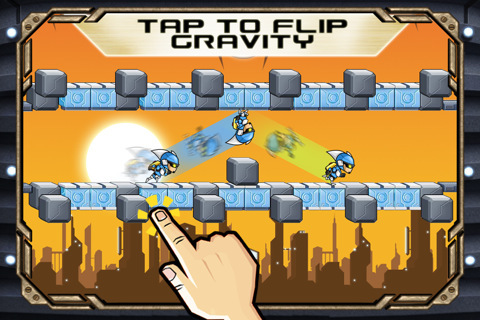 Released by Miniclip SA (makers of Fragger), Gravity Guy is available on the iPhone, iPod Touch, and iPad for $0.99 with a free alternative. Ha! Gravity Guy. Despite the oddly lethargic title, Gravity Guy is one of the more unique and intense versions of the distance gravity-toggle games that I’ve ever seen. Control your gravity by tapping the screen, go as far as you possibly can, and experience the chase! Controls are standard for games like these. You control the entire game through single taps. Tap the screen and your character will turn gravity upside down so you can run on the ceiling. You can’t jump so any small obstacle has to be avoided through gravity toggles. 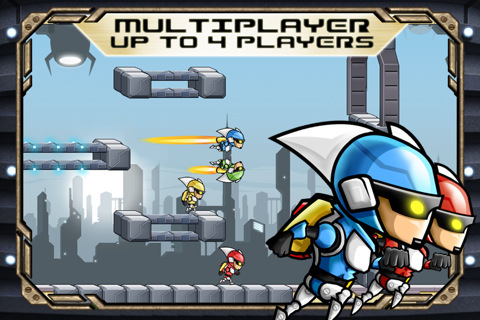 The game pushes the ante however and increases the speed to insane levels. There are points where you have to let yourself run off the platform and ‘fall’ onto the next one, then immediately toggle the gravity to not die. And that’s the point of Gravity Guy: Not die. A guard is chasing you after you break out of prison and if you get caught up on too many obstacles, he’ll catch you. Add some speed-boosting strips and your heart will be racing like crazy. Graphically, Gravity Guy takes simple palette swaps to a really interesting level. Morning, Afternoon, Night, and silhouetted, the game looks simply amazing. Backgrounds are interesting and the textures are really pretty. Your character looks like a cross between Sonic the Hedgehog and a South Park character and is highly stylized. The entire graphical package works really well. I love the one part of the first stage where you enter a room and suddenly the daylight changes to a huge white black light that immediately turns the game from Megaman into Limbo. The dramatic lighting definitely makes Gravity Guy stand out. Stages are actually carefully planned exciting levels rather than the randomly generated ones. You have checkpoints that you will probably become very familiar with over time. Dying is expected and luckily the checkpoints are very well placed. I absolutely love how little I got frustrated. Each time I finally overcame a specific part of the stage, I felt like I earned it. With 30 levels and 3 different worlds, the variety is strong and the challenge is always a rush. I found Gravity Guy to be amazingly fun and visually awesome. It’s rare for me to find an app that motivates me so much into completing each stage. I died so many times but it was worth it to see the next stage. I highly recommend Gravity Guy because it proved itself to me. There is a free version so you have no reason not to try it for yourself. Can’t you help a guy out? A Gravity Guy!? AppSafari review of Gravity Guy was written by Joseph Ho on March 2nd, 2011 and categorized under App Store, Featured, Fun, Games, Platformer. Page viewed 5128 times, 1 so far today. Need help on using these apps? Please read the Help Page.